It’s been very hot here by UK standards and Louis doesn’t like to venture too far; so much for his African heritage. As such he’s still full of beans when I’m ready to settle down for the evening. Louis appears wherever I am armed with his favourite tug toy which he deposits at my feet. Last night, however, it was so hot and humid all Louis could do was flop down on the carpet. I decided to stretch out as well and Louis saw that as an invite to play. With his favourite tug toy nowhere in site Louis decided the nexy best thing would be my arm. 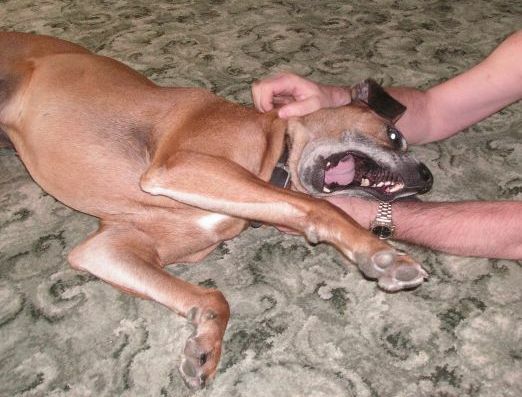 We then had a good twenty minutes or so of him rolling around trying to gnaw my arm off. Whoops. During the work on the house the original bath has survived all the upheaval and I’ve used it daily whilst Sue has sneaked off to her mum’s for a shower. However the time has come to get started on fitting the new bathroom; the builders finished on Tuesday (thank you Stuart and Nathan) and I’ve no excuse for not working. Anyway – with the change in the bathroom layout it soon became apparent that the cast iron bath was not going to leave in the same dignified manner that it was originally installed. We’ve re-positioned the door to the bathroom and it was not possible to manouevre the bath out. I had hoped to sell it it as it was a beauty of a bath (apart from the yellow colour). 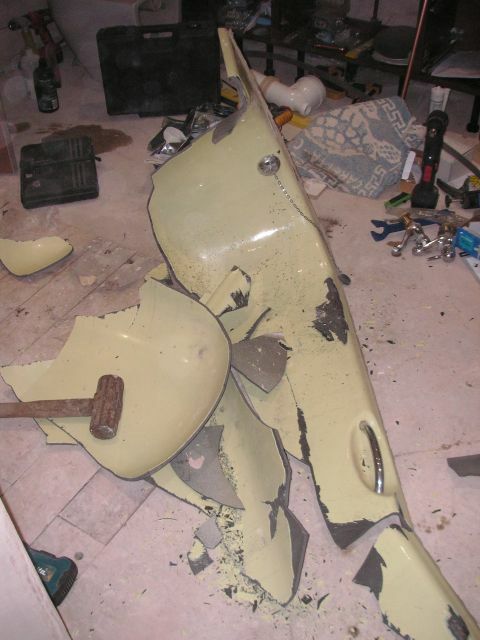 So – with a deadline to get the new bath in and operational – a decision had to be made. There’s a few dints in the new plaster due to the shrapnel that came flying off during the bath “adjustment”. 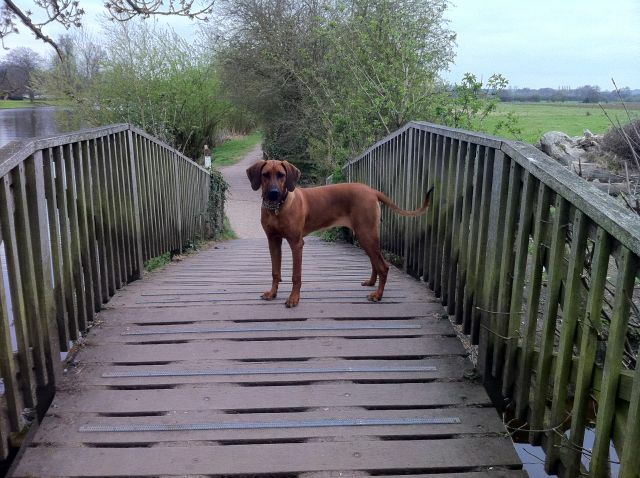 A few months back Tim from the south of England dropped us a line about his dog Kizzy after finding our site whilst looking for Rhodesian Ridgeback puppy weight/age information. Tim has just sent in this lovely picture of 7 month old Kizzy whilst out walking in Marlow Park, by the Thames. Tim’s email goes on to describe some of Kizzy’s behaviour. He’s borrowed a method from a Retriever owner (named Ben, that’s the Retriever, not the owner – it’s funny that we know most of the dog walkers that we meet by their dog’s name) whereby three pips on a whistle are used to recall Kizzy. This works most of the time apart when Kizzy sees another dog or something else worth stalking/chasing. This is exactly the same as Louis; trained to return when the situation warrants it (i.e. there’s a sausage reward) but he determines the “situation”. Louis returns immediately when you whistle him; however if you pop another dog, or a cat, or a biped, or a squirrel, or a few other distractions into the equation then it’s hopeless. One more thing from Tim that reminds me of Louis is Kizzy’s reaction to storm rainwater in a river. Louis is fascinated, at distance, by the foam generated by heavy rainfall run-off into out local Labybrook. He jumps into the river to investigate the foam and tries to capture (by biting) any foam that passes by. Kizzy seems to have the same fascination. Thanks, Tim, for the photo and the Kizzy anecdotes.